Crude prices have continued to decline on Monday on concern about the US economic outlook on getting data on consumer sentiment that fell to a near one-year low. It was reported that weak energy costs pushed US consumer prices down for a third straight month in June. 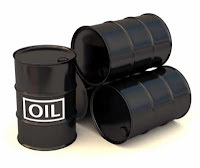 Benchmark crude for August delivery fell 22 cents to $75.75 a barrel on the New York Mercantile Exchange. The contract had settled down 61 cents at $76.01 a barrel on Friday, closing the week 8 cents lower than the previous week. In London Brent crude was trading lower by 5 cents to $75.23 on the ICE.